At tonights Parish Council meeting (June 7), our County Councillor, Stephen Askew shared some fantastic news. This being that Norfolk County Council are due to vote on a crossing on the B1077 to make this road safer for pedestrians. Four alternatives are to be considered. 4. Install a Pelican Crossing which stops traffic enabling a safe and secure passage over the road. Your Parish Council are looking to recommend option 4 at the next PC meeting. However, we would like to know your opinion. 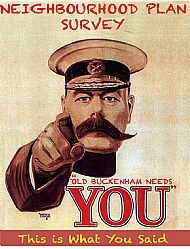 You can either use the "contact us" section of this web-site, or leave a comment on the Old Buckenham Blog, see the links section or come along to the next meeting on July 5th. The Parish Council wish the residents of Old Buckenham all the best for 2018, and look forward to meeting you at the monthly council meetings. Survey results have been released, go to Neighbourhood Plan page and click on the link.